Not all is lost though. Chivas owner Jorge Vergara already saidt hat if Chivas makes the league final the match will be on television. However, I am guessing that if Chivas TV streaming doesn’t pick up, as they are already offering 2 games for 1 specials, if they make the playoffs, their games will be shown on Television. JJ: I maintain that Chivas TV should have been free in year one to gauge interest. If the numbers plateau below expectations, Vergara will have lost his leverage with the TV folk. It is a shame, because for the first time in years, Chivas look to finally have a team that is worth watching. And they are due. The Chivas championship comet appears every ten years or so, and it has been ten years. JA: Indeed Yon, the team is capable of winning the liguilla. Not long ago they reached the semifinals. So, because of the Liguilla system it’s not uncommon to see stronger teams crash out and midtable teams swoop in for the win. Guadalajara’s last Championship came after the club qualified to the playoffs in 8th place. JJ: I do like chivas’ chances, but they are going to have to best a lot of quality teams. Namely, Pachuca and their archenemies. The defending champion Tuzos have been splash of color in an otherwise very dull start to the season. Rumors fly about Hirving Lozano’s future, and a good showing at the Olympics could expedite a move to Europe. But I am not so sure Pachuca is all that interested in selling him. They have the makings of building something very special with a strong core of young, exciting players. Why would they want to bust that up? The offer will have to be outrageous. JA: Agreed Yon, Pachuca is in a good position to maintain a very competitive side. As for Chucky I’m afraid the Tuzo vice president, Andres Fassi’s, prediction that he would command the biggest transfer fee for a Mexican player just went down the drain with Benfica paying a record €22M fee to Atletico de Madrid for Raul Jimenez. With all due respect I don’t think Jimenez eight goals last season warranted his value going up by 10m. This is more a product of the former Aguila striker being part of super-agent Jorge Mendes’ stable. There was even recent news that a club from the Chinese Super League offering 33 million for Jimenez! What that tells me is that Lozano is not deemed ready for the big time. Sorry (not sorry) but if any top club thought he could be a difference maker we would of had a concrete offer by now. Instead, we have mexi-pundits doubting he can start at Manchester United, who were betting on similar aged players like Marshall and Rasheem. JJ: Jimenez scored 12 in all competitions, actually, and despite the subpar output, Benfica has placed their hopes on his considerable talents for the season. I suppose in their eyes he has already proven himself. Did they overpay? We’ll see. Chucky’s talent is undeniable, but Liga MX needs a young superstar to sell the league. That is why if Pachuca does sell him, it would have to be for stupid money. There are teams that spend stupid money, but Man U is not one of them. JA: Yon, Man United has had their fair share of bad deals since Sir Alex Ferguson left. They were criticized by their own fan base for overpaying for Feilani. Marshals transfer is upwards of 80 million while they paid top dollar to have Radamel Falcao on loan. Compared to that Chucky would be a bargain buy. They would even make the money back on Molero games and jersey sales. That said, Javier ‘Chicharito’ Hernandez had been more consistent and a proven player and yet he hasn’t commanded such a high transfer. Which is why Mendes, who, in my opinion, has been the biggest factor in Jimenez’ eye-popping valuation. JJ: Mendes has an impressive list of clients, including Ronaldo, so Raúl did well to sign on with his firm. Mendes, in return, did what an agent is supposed to do: get the best deal for his client. The pressure is on Raúl now, but he can definitely handle it. You are right that his production went begging a little, but the goals he did score were crucial for Benfica’s title run. He has all the tools necessary to become a superstar, and Benfica has entrusted him to be just that. The Portuguese league may not be as strong as some of the other Euro Leagues, but Benfica is a very important club. A historical club. Eusebio’s club. There is something to be said for that. JA: Hopefully Jimenez can blossom into the power striker he threatens to become because we are in dire need of goal scorers. Oribe Peralta could very well be playing his last tourney with the Tricolor where he will be expected to carry the team to another medal at the Olympics. Interesting that it can end where it all started for him. JJ: Oribe, who is now 33 years old, could not have picked a better way to head in to the Olympics by getting a hat trick. His year in 2012, where he scored over 40 goals in all competitions, should go down as one of the best ever for a Mexican player. But the fact that Mexico has to lean on him again 4 years later does not speak highly of the progress Mexican futbol has made over the past 4 years. Only a handful of Mexican strikers start in Liga MX, while a smattering of others play abroad. Nevertheless, Mexico has been tapped to make the medal by Sports Illustrated. Honestly, making the medal round would be a massive accomplishment for this collection of players. The group (Germany, Korea, Fiji) is not the easiest, but not the toughest either. The squad is a mishmash of Pachuca and Chivas players with Cesar Montes, Oribe, and Alfredo Talavera. A base of players who are comfortable with each other is huge in a short tournament. JA: That Mexico is considered favorites for the Olympic tourney has been a double edged sword. Mainly because the success at youth levels has been used to justify getting rid of the 20-11 rule and mislead fans with the benefits of the new 10-8 rule. We are led to believe that Liga MX is producing good crops of players, better than ever before. However, realistically we have the same talent pool as 20 years ago. We still can’t top smaller countries like Chile and Uruguay who continue to churn out more players despite limited resources. It doesn’t matter that we have an overall better league or more money. In the end we end up with a false sense of entitlement. What has helped Mexico at the youth levels, more than talent, is the fact that the FMF invests heavily on the youth teams: on training camps, traveling expenses, and coaching so we end up with squads that are better prepared than the majority of their rivals. Then after the tourneys are over our young promises return to their clubs where they will slowly fade away. I’ve been saying this for a while now: Mexico’s success at the World Cup will not depend on the youth tourneys. We have this belief that all we have to do is polish the good crop of talented youth for the senior team but this is betting on a handful of players. Mexico’s success at the big stage is tied to Liga MX. The more talent we have playing, day in and day out, the deeper the player pool, and then we will have and better chances of developing world class players. This is how the Uruguayan league, a league that plays the majority of their games on the Centenario stadium, can produce more talent because they give their players more chances regardless of why they do it they are doing it. JJ: It is a topic we always circle back to. Liga MX imports talent, most South American teams export it. It is telling that the majority of South Americans signed by Liga MX teams in the off-season were those who did not find a soft landing in Europe. While dozens of Mexican players went not only unsigned, but do not have control of their own “carta.” Frozen, essentially. If they aren’t playing for team X, then they aren’t playing, period. JJ: As long as the Liga MX teams take it seriously, and fortunately we have seen that happen over the last couple of years. Let’s hope the trend becomes permanent. 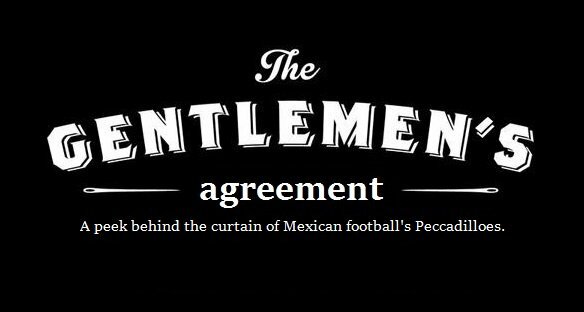 Of course, it would behoove the Liga MX officials to read this column and accept our recommendations. We are gentlemen, after all.